Dan Simmons reports on whether our newly found freedom to buy almost any song using the internet is being unduly fettered by the digital music police. Just a year ago the music industry was sweating as countless file sharers used the mp3 format to copy and swap tracks for free. They still do, but a few knockouts against file sharing networks, thousands of lawsuits against the swappers, and an explosion of online music stores have all got the industry back on its feet. Download sales tripled last year, and it appears the number of file sharers has levelled off or - in some countries - taken a fall for the first time. Yet, as fists continue to fly, it seems paying customers may be getting caught out by music industry tactics. One of those in the red corner is EMI, which has the largest collection of copyrighted music in the world - including the Beatles and Kylie. With so much at stake it does not want to let its songs go into the ring unprotected. You will not get a simple mp3 from the four major record labels, but you will get one of several formats that gives them more control. The technologies used to stop you copying as you wish are called digital rights management - or DRM. There are several ways in which it has started controlling what we do. For one, there is no more unlimited CD burning. Most DRM formats now count the number of copies you make and stop you burning when you reach that limit. iTunes is perhaps the least restrictive for this. The number of times you can copy music to other computers, laptops or portable players is capped in much the same way. The trouble is that if you upgrade your hardware too many times you may have to buy your music collection all over again. Copy protection software on some newer CDs makes copying, or "ripping", them to a computer difficult too. Some send data to your ripping software designed to confuse it. Others simply will not allow you to access the copy command. Consumer groups say this form of digital rights management just confuses customers and can leave them out of pocket. 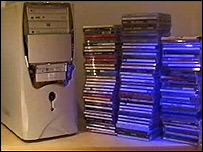 Diane Gaston, from the UK's National Consumer Council, says: "People are telling us more and more often that they buy a CD which they expect to be able to use in a variety of different ways at home and they simply can't do that, whether that's using it on their computer or on other pieces of equipment. "We would expect people to be able to pay once for music. They shouldn't have to then pay a second time to download once they've bought a CD." Most countries have what is called a fair use policy enshrined in their copyright law. It allows a reasonable number of copies to be made for your personal use. But DRM has lets the music industry put a cap on that figure, and enforce it. The major labels say it is up to us to decide whether they are being fair, as Barney Wragg, of Universal Music, explains. "If people don't like DRM, or a product or service that you're offering, they will vote with their wallets. "They won't buy, they won't subscribe, they won't come and do things. So we have to find the balance that gets the right product and the right service with the right DRM at the right price to consumers to attract them in to grow this market." But how can you decide what restrictions you are prepared to accept if you are not warned? Three months ago it was discovered that Sony BMG was using secret software to stop copying of some of its CDs. The software used virus-like techniques to hide itself and opened up vulnerabilities in the Windows operating system. The discovery turned into a PR disaster and which showed just how far one label was prepared to go. The industry says never again. "Emphatically, it's not something we have ever done or would ever do. We're not interesting in "spying" on our consumers, we're not interested in harvesting that data. It's not something we would want to do at all", Barney Wragg told Click. Digital rights management has also opened up new ways of selling songs or, put more precisely, renting them. With subscription services users can download an unlimited number of songs. A keycode is embedded in the files, which is updated each time you go online. Stop paying the monthly fee and your tracks will not play. But we are also being sold something we used to take for granted. Basic subscription services will not allow you to take your music with you. Tracks do not play on portable devices unless you pay more. Brad Duea, the president of Napster, says: "We actually view DRM as an enabling technology. "Using Windows Media 10 allows us to create this Napster To Go portable subscription. "So we try not to view the DRM as something that limits consumers but instead enables them now to take all their music on the go." Unlike CDs, not all paid-for downloads work on all devices. iTunes encodes music files in AAC format and protects them with its Fairplay technology, which is proprietary to Apple and only works on iPods. The makers of other players want to support Fairplay, but so far Apple has refused to licence it.. 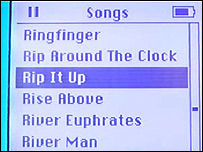 Likewise, the widely recognised Windows WMA format is not recognised by iPods. The industry says it is more than a year away from sorting out the problem. Not all labels think the DRM formats are a good thing. Many smaller independents, such as eMusic, which sells unprotected mp3s, think it only succeeds in driving customers away. Ray Farrell, eMusic's vice president, says: "I don't think that the digital distribution companies believe in DRM. I think they're doing it at the behest of the majors. "If the majors would all turn around and say to one company: 'you can have mp3s', every other company would turn around and say: 'wait a minute, we never liked DRM in the first place, we want to be able to sell a lot more downloads too'. 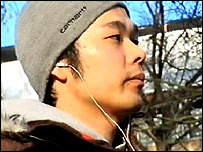 "Despite the fact that there would be no DRM I think the sales of digital downloads would increase. I just don't think that, at least on the independent label level, and on the breaking artist level, piracy is all that much of a problem." Digital rights management is clearly useful in tackling piracy, but it can also frustrate the paying music lover. How simple, fair, and effective it is may be key in who wins the next round.